When the tooth #19 is extracted, the mesial socket is larger than the distal one. The initial osteotomy is set up mesial to the septum (Fig.1 <), 8 mm from the septal crest, 6 mm from the bottom of the mesial socket. There will be 6 mm new bone to support an implant. 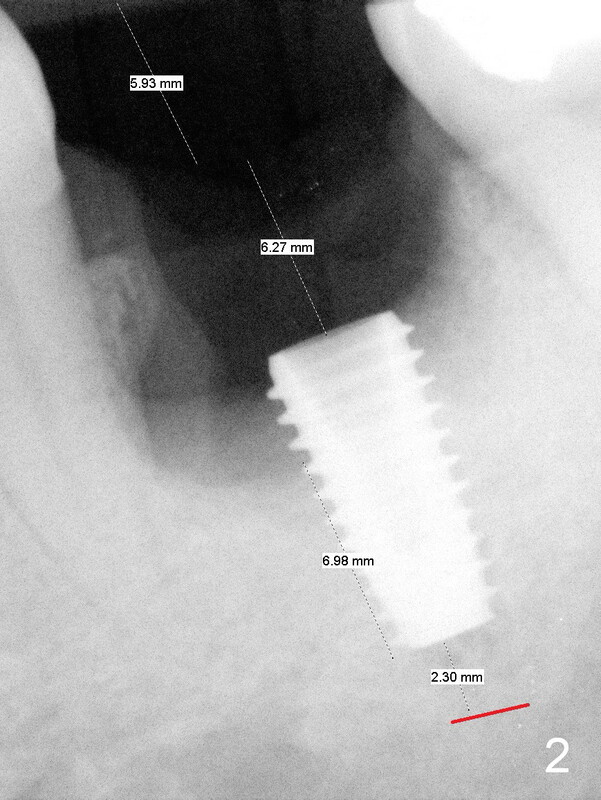 When a 5x10 mm implant is placed (Fig.2 with 50 Ncm), the coronal threads are exposed circumferentially. 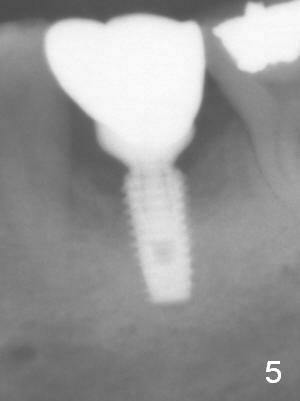 Bone graft is packed around the implant in layers after placement of a 7.5x4(5) mm abutment (Fig.3). The 1st one is composed of autogenous bone and cortical and cancellous allograft (.5-1 mm in size), while the 2nd one consists of the allograft mixed with Osteogen. The 3rd layer is collagen plug cut in strip. 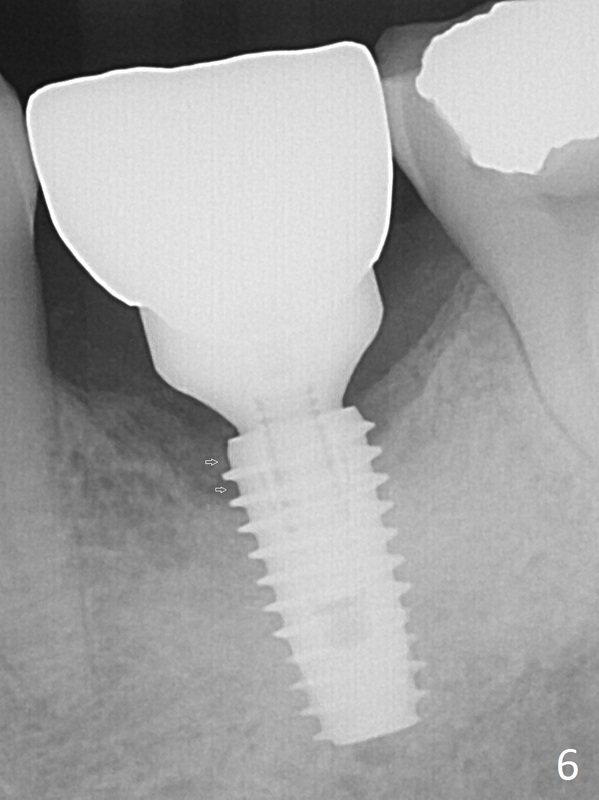 The latter is held in place with applying provisional acrylic over the abutment and the socket opening while it is setting. Some of acrylic is pushed into undercut areas for retention. No attempt is exerted to remove the provisional. The latter will be adjusted approximately 1 month postop. Why does the 1st layer of graft look so dense? The first, the native bone is hard. The second, the allograft is mineralized cancellous and cortical. The size is larger than those used before (.125-.85 or .25-1 mm). 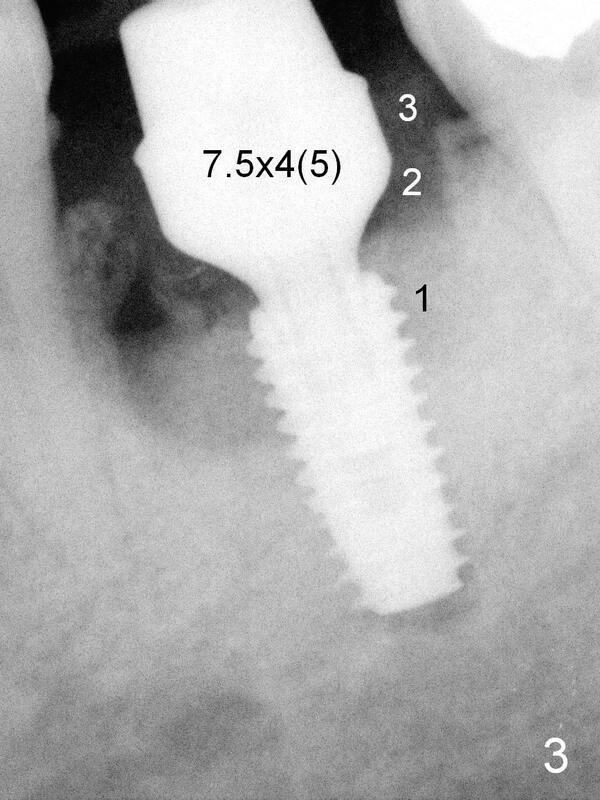 Four months postop, there is bone next to the implant (Fig.4 *). The margin of the abutment is prepared prior to impression for final restoration. 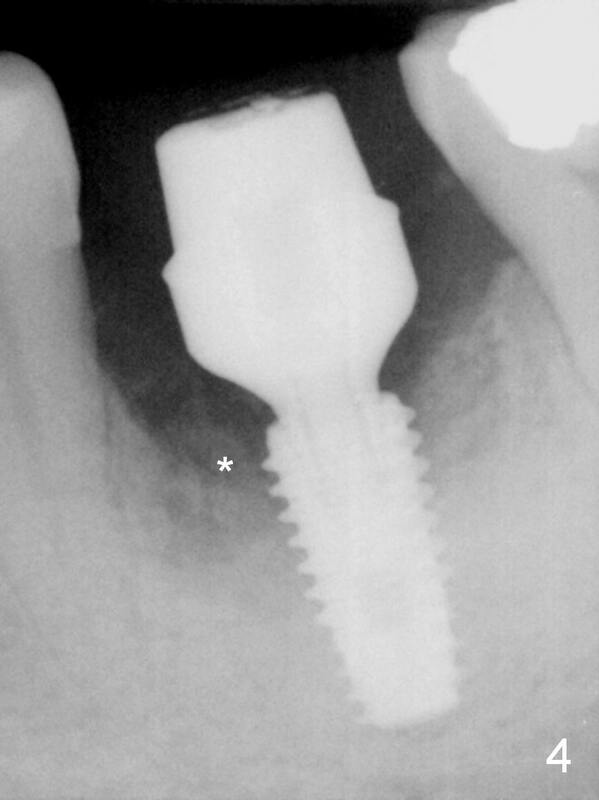 Panoramic X-ray is taken 3 months post cementation (Fig.5). 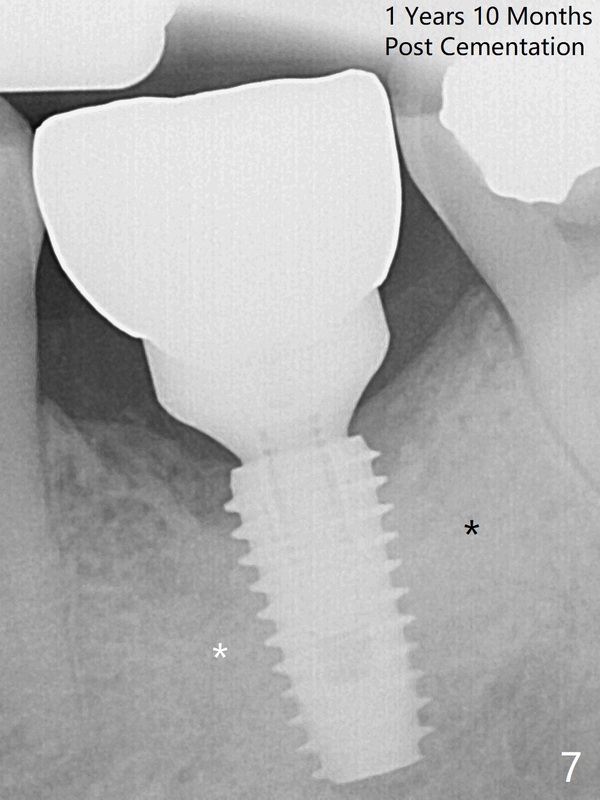 The gingiva looks healthy around the implant crown. New bone appears to have grown into the most coronal threads 9 months post cementation (Fig.6 arrows, 14 months postop). 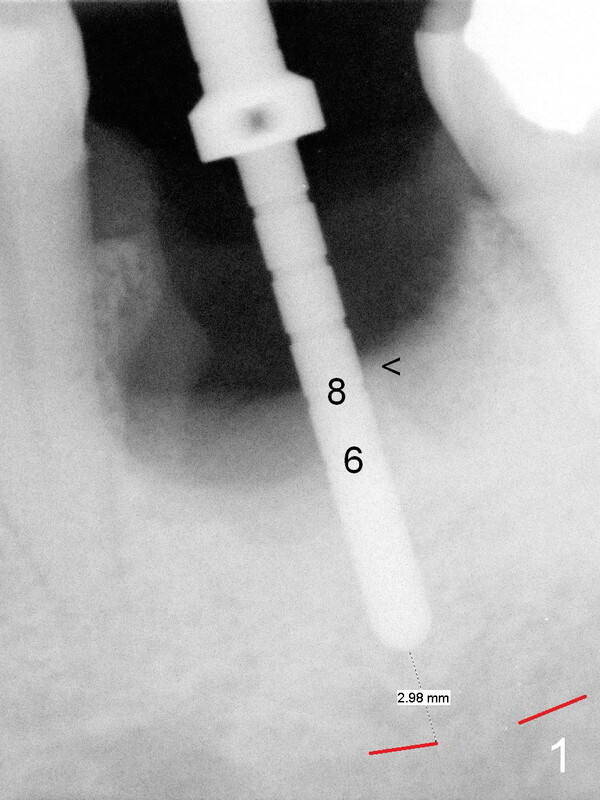 The bone continues to condense around the implant 1 year 10 months post cementation (Fig.7 *).